The ancient sages spoke of being able to understand the most obscure of oracles with the belief that fraud was banished from the presence of a sapphire. In the twelfth century the Bishop of Rennes wore sapphires in ecclesiastical rings based on these ancient spiritual beliefs. Star sapphire is worn to represent faith, hope and destiny. These three are represented from the light beams reflecting off the top of a cabochon-cut sapphire that exhibits three crossed lines. The star sapphire’s reflective beams were believed to signify the lights from the Star of Bethlehem and named “the stone of destiny” from this belief. The Etruscans wore the oldest sapphire jewelry, dating to the seventh century, and the Greeks, Egyptians and Romans treasured sapphires. 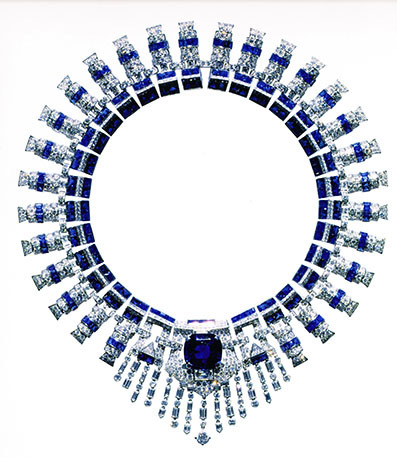 DeBoot wrote in 1609, that the Germans revered sapphire as a victory stone. Sapphire mining began in 544 B.C., before the time of Buddha, in Sri Lanka. Marco Polo’s travels took him to the ‘Island of Serendib’, known as Sri Lanka, where he admired the stunning and colorful stones. The Hindus, Burmese and Sinhalese recognized that ruby and sapphire were of the same mineral long before the Europeans did. It wasn’t documented until 1800 that ruby and sapphire are gem varieties of the mineral corundum. Corundum is found in many different colors, depending on the percentage amounts of the different metallic oxides incorporated within the crystal. 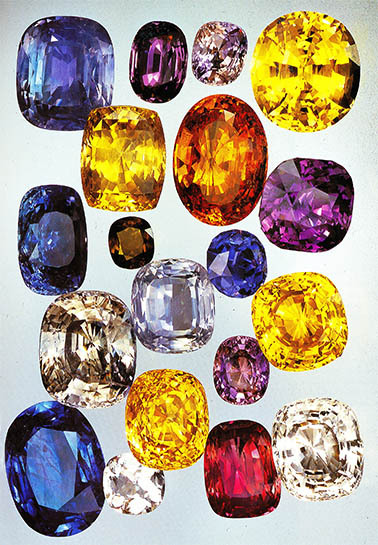 Sapphires can be yellow, pink, violet, green, brown and orange, in addition to the blue hues. Padparadscha, a rare, vivid orange sapphire, was named from the Sinhalese word for lotus flower. 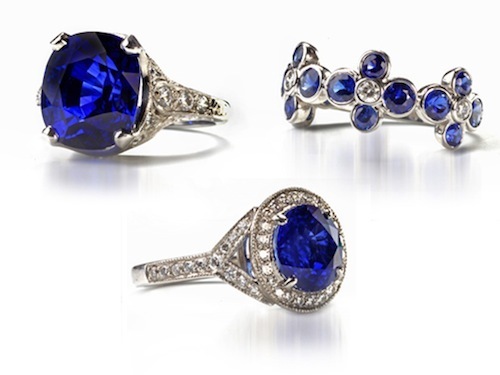 Derived from the Greek word sapphirus, the word sapphire means blue. In the Middle Ages sappirus was also used for the blue stone lapis lazuli, causing confusion between the two stones. The Ten Commandments were said to have been written on a sapphirus stone, referring to lapis lazuli. The American Museum of Natural History houses one of the largest, finest quality star sapphire, weighing 536 carat, named the “Star of India.” One of the largest known rough (uncut) sapphires is a 2,302carat –and, amazingly, the gem carver, Norman Manes, spent eighteen hundred hours carving the form of Abraham Lincoln’s profile. 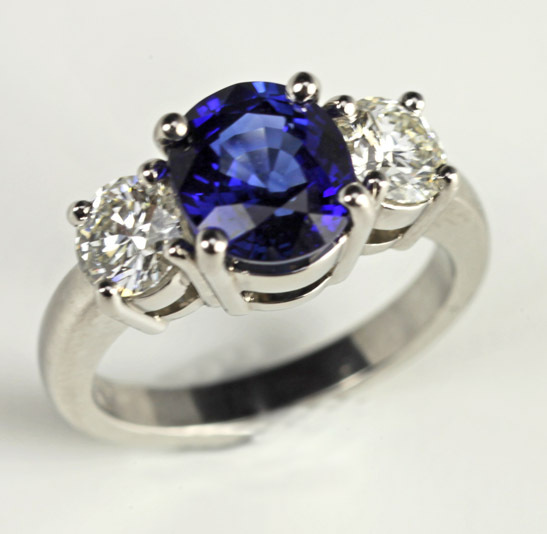 Ideally, a blue sapphire should exhibit an intense blue without color zoning or internal flaws. Color zoning refers to a variation of shades of color intensity from within a stone, reflected deeper blue hues distinctly separated from lighter hues. Internal flaws within the stone may appear as white or black lines or specks, greatly diminishing the value. Sapphires with an inky blue color and an overall forest green tone is the least valuable and primarily from Thailand and Australia. Sapphires are formed in syenite and pegmatite secondary deposits, known as alluvial deposits, a product from the weathering of the original rocks, called byon. Sapphire crystals grow in the form of a hexagonal bi-pyramid of twelve triangular faces. With hardness on the Mohs scaleof 9, the sapphire is durable. However, a sapphire should be handled with care, if dropped on a hard surface it will crack internally.The most famous source for fine sapphires is the district around in upper Myanmar. Other important sources for sapphires have been Thailand and Cambodia; where gem deposits are derived from basalt, an iron rich rock. Recently, in 1980, gold miners unearthed gem quality rubies and sapphires northwest of Hanoi, Vietnam. Sapphires that are of a scintillating, pale blue color, known as cornflower blue, are from India, near the district of Kashmir and are frequently called Ceylon Sapphire. However, the name Ceylon Sapphire is used to identify the specific light hued, sparkling, violet blue color and Ceylon may not be the original source of the stone.Sapphires with colors ranging from blue, violet, purple, yellow, orange, white and pink are found exclusively in Sir Lanka. No other mines have produced a greater variety of colorful hues. Discovered around the globe, sapphires have been obtained in China, Afghanistan, Pakistan, Australia, United States, Kenya, Tanzania, Nigeria, Malawi, Zimbabwe, Brazil, Colombia, Norway, Finland, Czechoslovakia, Russia, Romania and Borneo.Sapphires are cut in different shapes. Finer quality stones are typically cut in a step cut, oval or round. 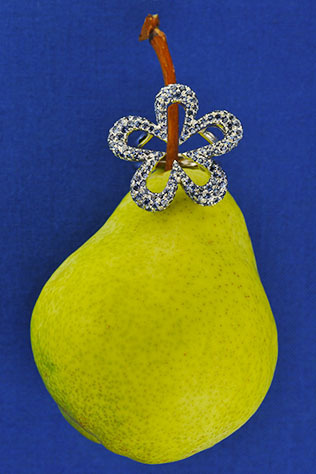 Flawed and poorer quality sapphires are tumbled into beads or used for carving. Jean Toussaint, nicknamed ‘The Panther’, worked with Peter Lemarch in the design department at The House of Cartier. The duo created a collection which became famous, originally called ‘Great Cat Jewels, currently known as the Panther Collection. In 1949 the Duchess of Windsor acquired one of the first created and most famous diamond and sapphire panther pins, which she frequently wore. Jewelry collectors, such as Barbara Hutton and Daisy Fellows were envious of the Duchess’ sleek panther pin. This competition prompted orders for magnificent panthers in varying poses from Cartier Jewelers. 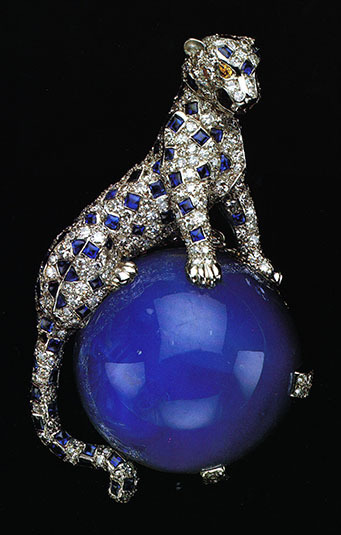 The image is a crouched panther in a life like pose on a large perfect round cabochon star sapphire weighing 152.35carats. The Panther motif has become one of Cartier’s most iconic designs, incorporated in their jewelry and watches collection. 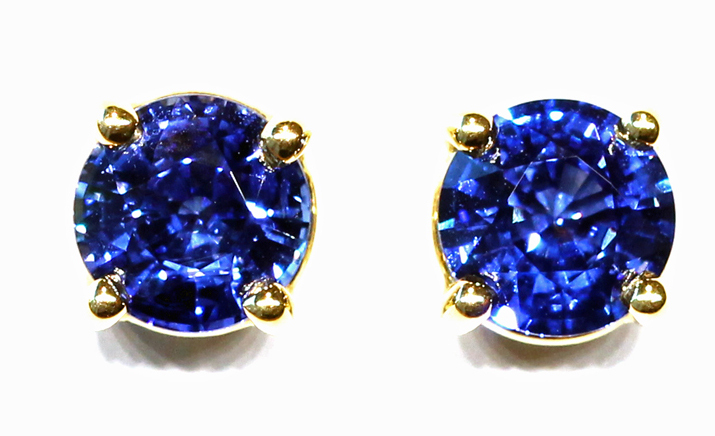 Janet Deleuse Fine Jewelry multi colored Sapphire briolletes. Created to commemorate the exhibition of the treasures from Tutankhamen on exhibit in 1972, this unique Egyptian style necklace was designed by Bulgari. 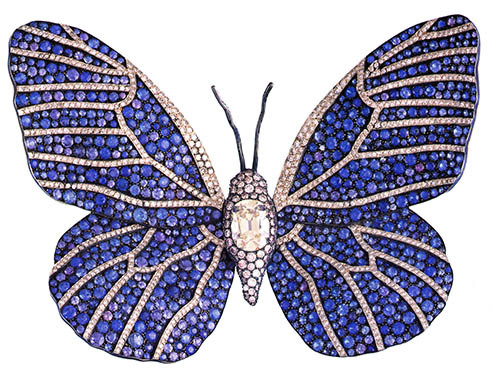 Incorporating a mix of colorful combinations of sapphires, Bulgari produced a fitting jewel for the occasion. Large cabochon cut blue sapphires, black onyx, salmon pink coral and diamonds –the necklace was designed in lotus flower motifs. 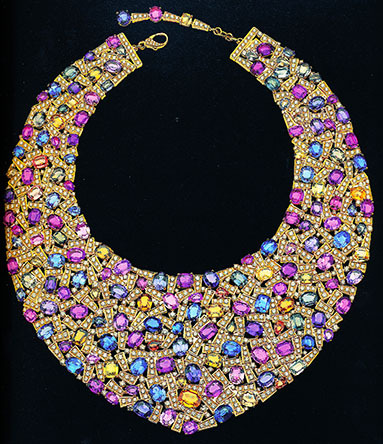 Representing Egyptian art form, in color and mantle style, the necklace is comparable to the jewels worn by the Egyptian royalty.